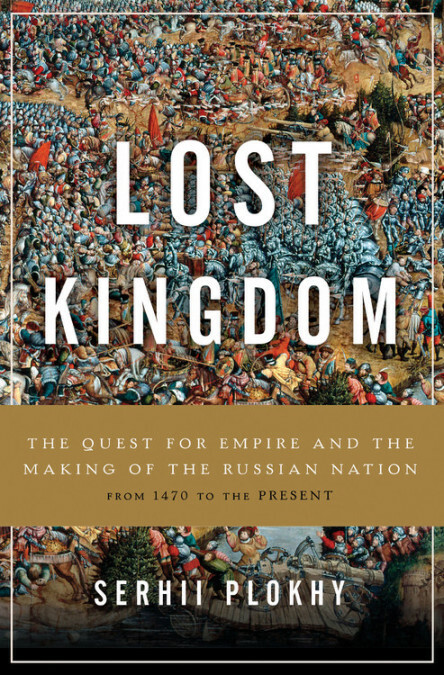 Covering the late 15th century through the present, Lost Kingdom focuses specifically on the Russian nationalism, exploring how leaders from Ivan the Terrible to Vladimir Putin instrumentalized identity to achieve their imperial and great-power aims. Why does Russia have such obsessive territorial ambitions in Ukraine? The new book Lost Kingdom by Serhii Plokhy reaches for a historical understanding, and asks one critical question that resonates over centuries ...Plokhy maps out the constant shift of borders in the eastern reaches of Europe, and leads the reader through Russia’s history by focusing on the key political, religious, and academic figures that set the country’s imperial aims ...does not take an apologetic or forgiving tone toward Russia’s recent military actions. His opinion is, in fact, kept in check through most of the book ...suffers from anything, it is from a lack of social viewpoints ... A narrow focus on the cities does not create a complete portrait of a vast nation, however ill-defined. His latest book, Lost Kingdom, tells the story of how the history of Russia was being written when that history was being made ...a singularly fascinating account of Russian nationalism through the ages ... Plokhy focuses on Russia’s western frontier as both a psychological and geographical boundary that has always been a critical determinant of Russian national identity ...shows that the intellectual outcomes of the way nationalism was discussed mattered as much or more than the physical events on the ground. What did you think of Lost Kingdom: The Quest for Empire and the Making of the Russian Nation? An unpublished follow-up to A Clockwork Orange was found. Read a new story by Daisy Johnson. On the life and legacy of Gene Wolfe. Joy Harjo has won the 2019 Jackson Poetry Prize.